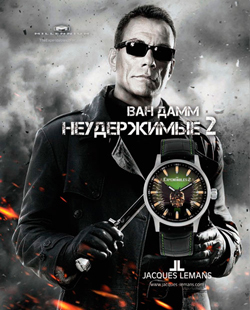 Austrian brand watch Jacques Lemans, in collaboration with the creators of the blockbuster “The Expendables 2” and Jean-Claude Van Damme has released a collection of hours Expendables II. The actor presented the clock in the movie and became the official face of an advertising campaign. 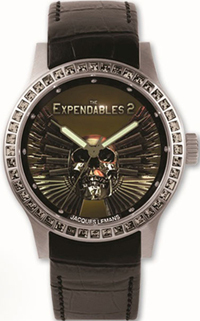 Collection Jacques Lemans Expendables II includes several male and female models with special 3D-elements of the dial. The strap is made from genuine calf leather, individual models it is contrasting stitching, emphasizing their masculinity. Continues to develop the theme of brutality line hours with rivets on the strap, simulating bullet. Deliberate force and pressure is relaxed in female models, decorated with crystals Swarovski. The arrows separate clock applied luminescent coating. All watches are equipped with a proprietary glass Crystex, combines the advantages of mineral and sapphire crystals. The models – quartz movement. The collection includes a clock with a round body and a square. Its diameter ranges from 40 to 49 mm, thickness – from 11 to 13 mm. In Russia, the collection view will go on a limited number. The number of individual models available for purchase in the country is only a few dozen. A small number of hours will be drawn among movie fans. Ferrari SpA and the Movado Group Inc.